Today, there is again a small software update. Since yesterday, namely the new version (1.2..0.0) of my software “WordPress2Doc” is available for download. In addition to a bug fix also two small new features are added. For those who can not remember what WordPress2Doc is good for ot those who are new in the “code-bude.net”-community, I’ll explain the benefits of Wordpress2Doc in a few words. 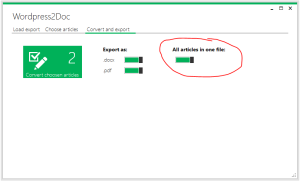 With WordPress2Doc you can save any (as well as many) articles and pages of a WordPress blog as a Word document (.docx) and as a PDF file. So with WordPress2Doc you can, for example, back up your blog posts, print and prepare them for other use cases. Short info: After Habared has kindly told me on GitHub that my “WordPress2Doc” tool has a few problems with UTF-8 characters, I took time and wrote a small fix. In fact, I had missed the character encoding in the HTML code that is embedded in both, the generated .docx- and .pdf-documents. The latest, UTF-8 compatible version of WordPress2Doc can be found both in the main article and on GitHub. I would appreciate any feedback! WordPress2Doc is a small program I developed, that enables you to convert your WordPress articles into Word (docx) documents. In addition to the Word format (.docx) the PDF format (.pdf) is available as a target format. 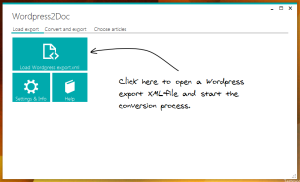 For the conversion, the program makes use of the WordPress export XML file and can convert the items inside the export file in one or both of the aforementioned formats. Tip: The download link for WordPress2Doc is at the end of this article! Who needs no further information, can now confidently scroll to the bottom of the article. To convert your WordPress articles into .docx or .pdf format, the relevant articles must be exported from WordPress at first. This can be done at WordPress’ backend. Therefore open the administration page of your blog and navigate to the “Tools-> Export” menu in the WordPress backend.